This blog seeks to introduce some of the worth-visiting European cities, such as Berlin, Barcelona, Madrid, Edinburgh and Lyon, which are precisely the destinations for some CTR projects. The blog also gives you some information about the study work gap projects organised by CTR, how it works and how to join them. Don’t forget to browse our gallery on the right sidebar to see how CTR projects are exactly like! Being the third largest city in the European Union and the largest city in Spain, Madrid is a modern centre for political, economic and cultural activities. It houses the head office of various major Spanish companies, headquarters of international organisations and is also a site for holding various global institutional events. That said, the Spanish capital still maintains a strong historical and cultural flavour. The Royal Palace, the Almudena Cathedral and the Plaza Mayor are major landmarks that reveal how the Madrileos preserve their past. Particularly for the Royal Palace, it is the official residence of Spanish Royal Family and the largest palace in Western Europe. And thanks to its Baroque and Classicism style, it is definitely a monumental attraction to visit. To see a more cultural or artistic side of Madrid, Prado Museum is not to be missed. The museum displays a huge collection of paintings, sculptures, illustrations and drawings that can take you a day to see all the stunning masterpieces. Adding to that are Sorolla Museum and Thyssen-Bornemisza Museum that also exhibit an abundance of Spanish and North American works. Let’s not forget bullfights that Spain has been known for. If you travel to Madrid in May or June, you have picked the right timing because it is when the San Isidro bullfight festival is held. The festival attracts the world’s bravest fighters, best bulls and enthusiasts, and you will get the opportunity to watch different kinds of breath-taking bullfights, ranging from young bulls and bullfights on horseback to fight in period costumes. Indeed, travelling Madrid is a great way to learn about Spanish history, culture and customs because it shows you the unique character of this city. 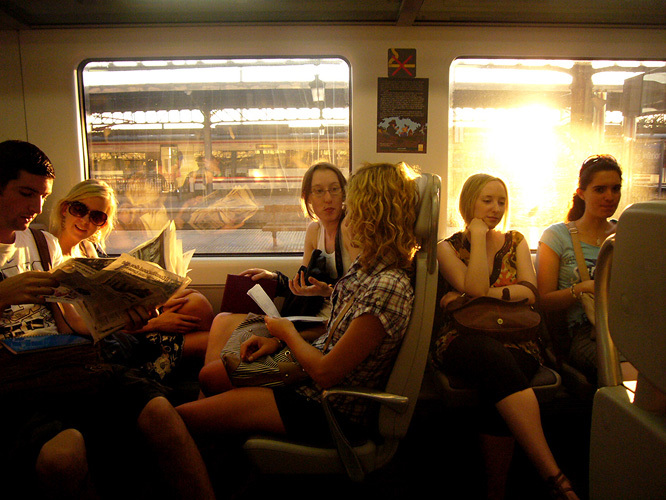 If you have a longer vacation or a gap period and you plan to stay in Madrid, it would be even better as you can live in the city as if you are a local and feel the genuine culture which could be completely different from what you have experienced before. CityTravelReview organises study work gap projects for young people to gain experience through publishing a tourist guide. These gap projects incorporate study, work and travel because on one hand, members get to visit a city of interest for a month or two, and pick up or improve the local language in the place where it is spoken; on the other, members will work as a team to create a travel guide with the help of journalism workshops. 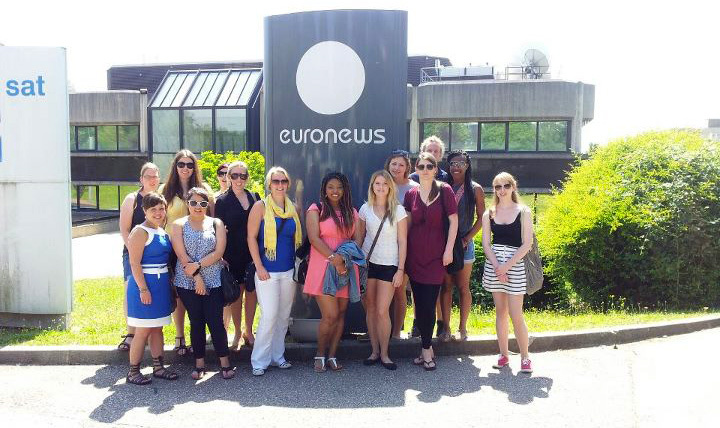 It is true that students who study journalism, history or geography are often very interested in these projects because they could acquire practical knowledge and experience. Nevertheless, the projects also attract other young adults who are enthusiastic about travel writing and cultural exposure, or who want to do something different. Upon completion of the project, what you will gain is not merely an additional item on your resume but also the essential skills, work experience as well as the incredible memories with other project members. CityTravelReview projects are available during summer months in various interesting European cities such as Berlin, Lyon, Edinburgh, London, Madrid and Barcelona. During the project periods, project members usually take language classes in the morning and in the afternoons, the team is involved in workshops and other project related activities which are useful for the production of the tourist guide at the end. In particular, members visit numerous tourist attractions, explore any local spots and enjoy different sorts of entertainment in the city. They will then compile the information gathered, write reviews and design the layout and graphics to be included in their amazing travel guide. For more information, you may visit the CTR website or contact us. How much do you know about Lyon? Famously known as the Silk Capital of the World, Lyon is an incredible hub for fashion designers, either to display their own designs in boutiques, or to turn their inspiration into amazing works. This east-central French city is also a major economic centre for banking, chemical as well as biotech industries. While you may then expect a modern city with chic looks and dynamic lifestyles, Lyon also has its historical character that one should never miss. The Roman district and Fourvière, and the Renaissance district (Vieux Lyon) are examples of historic sites in Lyon that are designated a UNESCO World Heritage Site. 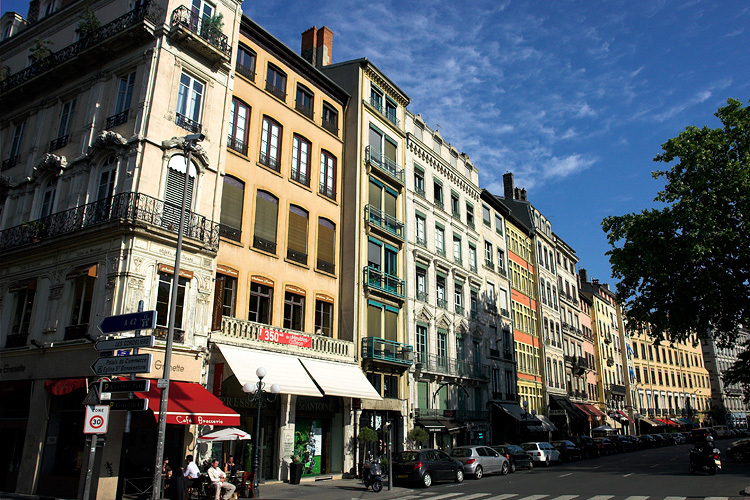 CTR members going on a Lyon project are often amazed by this picturesque French city. 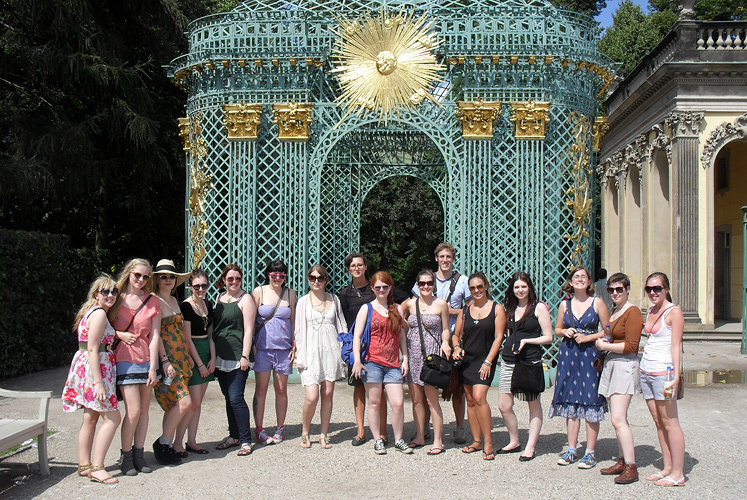 Joining guided tours, taking French classes and exploring the city in groups are what project members do in the internship period to experience, enjoy and gather information for their creative travel e-book. The experience does not only help improve the members’ language skills, but it also gives them a chance to explore a new city on their own and gain a first-hand cultural insight throughout the whole project period. Edinburgh, Scot to be fun! Indeed, Edinburgh is one of the most beautiful cities in Europe with stunning landscapes and and magnificent skyline. Edinburgh Castle, for instance, is the well-known historic fortress situated on a volcanic rock in the middle of the city. This iconic Scottish attraction comprises several museums, a memorial, the royal palace and a few more places. With its amazing architecture, the castle has dominated the city’s skyline for centuries. What’s more, as the home of Scottish Enlightenment, the city is also rich in history, art and literature. A historical must-see is the Royal Mile, one of the most famous streets in the Old Town of Edinburgh which connects the Edinburgh Castle with the Palace of Holyrood House. Along the path of the Royal Mile, there are numerous attractions, such as St. Giles Cathedral and The Writer’s Museum, and also a lot of pubs, cafes and restaurants, giving the town an interesting and vibrant atmosphere. To see the artistic culture of Edinburgh, Scottish National Portrait Gallery and the Scottish National Gallery of Modern Art are two great options. There you can find a wealth of paintings, photography, sculptures and films which help understand the nation’s identity and cultural heritage. 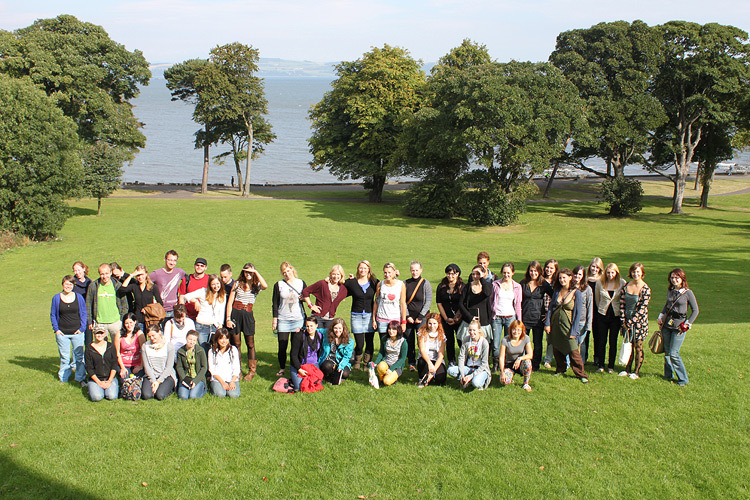 Over the past few years, CityTravelReview members have done projects in Edinburgh to create a travel guide for young people. The project members had the opportunity to visit tourist attractions, experience first-hand the entertainment that Edinburgh has to offer visitors, and write reviews on their recommended places. Other information such as the history, survival guide, dos and don’ts in Edinburgh and fun facts are also included in the guide. To make the publication even more attractive and user-friendly, the groups had tried to search for the best eateries, bars and any points of interest in the city and offered suggestions to tourists. As the projects came to an end, the guides were made available in hardcopy or online for interested parties to know how it’s got to be fun in Edinburgh. It is true that Barcelona does have 4.2 km of sandy beaches where you can take a dip in clear waters, relax under the warm golden sun or have a refreshing cocktail. It is also true that the city offers an abundance of mouth-watering tapas and a wide selection of fresh Mediterranean seafood that you can sample at lively bar or traditional restaurant. However, Barcelona is not just a typical Spanish city. Thanks to the famous Catalan architects Antoni Gaudi and Lluís Domènech i Montaner, Barcelona is the capital of Modernism where you find world-renowned architectural buildings that are listed as UNESCO World Heritage Sites. One example is the church of La Sagrada Familia originally designed by Gaudi in the 19th century. The building is known for its innovative and sophisticated design with parabolic arches and branch-shaped columns. Although the construction of the church is yet to be completed by 2026, this stunning building is an absolutely must-see. Barcelona is also a city with spectacular views. The Montjuïc Hill is a popular place for seeing a panoramic view of the city. Despite its location on the mountain, there are a museum, a Spanish village as well as a magic fountain which fill the place with a distinctive character. In particular, the magic fountain, also known as the Font Màgica, offers a fantastic show of moving water jets with coloured light rays and background music that most tourists enjoy watching. For those who are interested in the true Catalonian culture, visit the busiest and most interesting street in Barcelona, La Rambla! At La Rambla, not only can you see tapas bars and souvenir kiosks, but you can also see some amazing architecture and historical structures right above these shops. Also at La Rambla is the La Boqueria Market; it sells the freshest food in town, so make sure you grab a bite of some delicious Spanish snacks. Apart from what is permanently on the street, there are some temporary ‘art works’ as well. Ranging from marble stone statue to famous celebrities, street performers dressed up as living statues to entertain people on La Rambla, giving the street a distinctive and fun atmosphere. 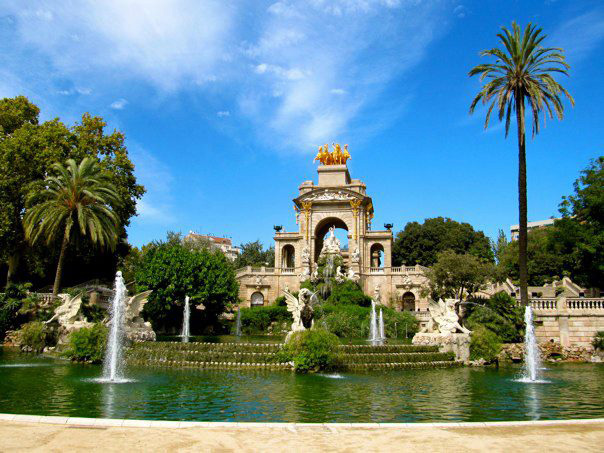 In the Barcelona projects organised by CityTravelReview, members had the opportunity to experience the real Catalonian culture and capture the cultural side of Barcelona. 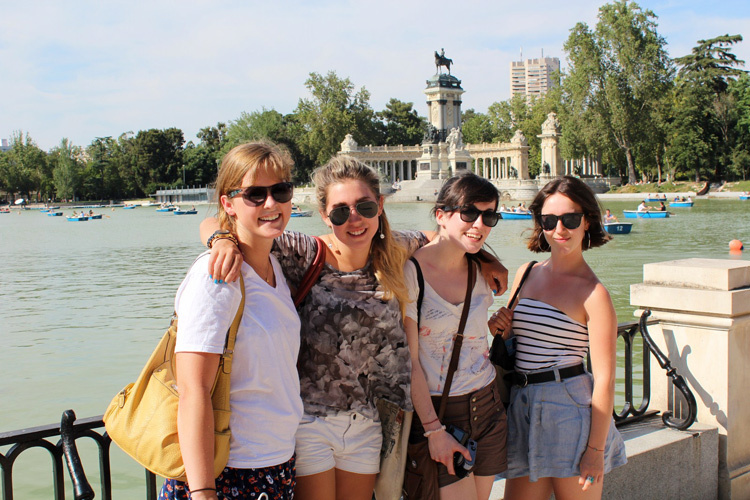 Instead of only swimming at a touristy beach or going to a crowded museum, members also explored the city from a local’s perspective and immerse themselves in the genuine Spanish culture. At the end of the project, they were expected to recall the experience they had, compile the relevant information and graphics, and publish a creative travel guide for young people. It is absolutely fun to travel with a group of young people, but what else you can bring home is the team skills one developed through cooperating with people and writing up a guide from scratch. When it comes to Berlin, what’s the first thing that comes to your mind? Brandenburger Tor, Berlin Wall, bear or beer? Being the largest city and the capital of Germany, Berlin has all it takes to be a place worth visiting for people of all ages. For those who are interested in history, the Berlin Wall and Checkpoint Charlie will tell you, in an illustrative manner, how Germany, as well as Berlin, was divided into four occupation zones by the allied powers, and how people in those days could cross from one zone to another. Close to the Berlin Wall remains is the Topography of Terror, which was the headquarters of the Gestapo and the SS. It is now an exhibition about the institution of the SS and the crimes perpetrated throughout Europe. The Berlin Wall is not only about history. If you are an art lover, take a stroll along the East Side Gallery to see the paintings on this 1.3 km-long section of the Berlin Wall. Alternatively, you may spend a day on Museum Island and do a museum crawl. What’s more, this capital city of Germany is also full of amazing architecture. The famous Brandenburger Tor, Reichtag, Berliner Dom, and Marienkirche are all beautifully constructed and they stand out by their own unique styles. As these sights are not far from each other, wandering around in the city or riding a bike is a great way to explore the city, see the ubiquitous graffiti and feel the Berliner atmosphere. While the city may already seem fairly interesting for travelling, there is indeed much more to explore. 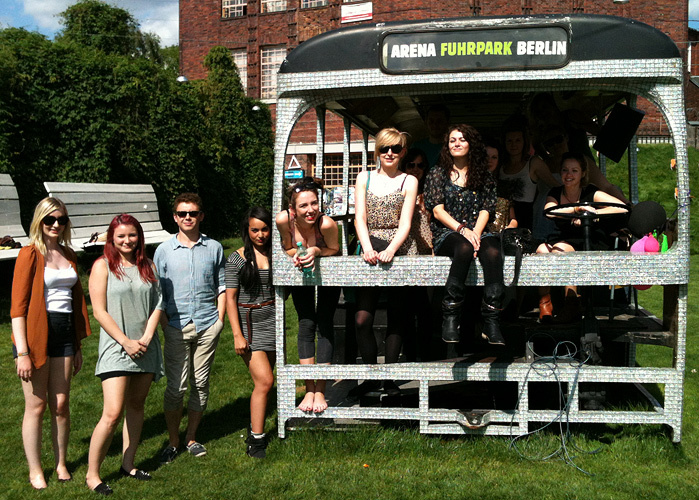 If you have a month or two, it will be ever better because you can get to know Berlin in a not so touristy way. Take shopping as an example, a typical travel guide will lead you to the most famous shopping malls and department stores. But if you get the chance to feel like a local, the flea markets, such as the Trödelmarkt or Kunstmarkt will amaze you because they sell everything, from your grandmother’s china to the latest hipster trends in vintage fashion. In CTR, project members in Berlin usually work closely together for 1-3 months to produce a stunning tourist guide for young people. In the mornings, they attend classes to polish their German language skills and in the afternoons, members sometimes take journalism workshops and in other times, they go around the city to research on the sightseeing spots, museums, restaurants and beer garden, etc.. Project members also conduct interviews and write reviews on the entertainment that they enjoyed in order to make their tourist guide more intriguing and helpful.